Monster sunspot AR1476 is visible over Paris in this skywatching image. Sunspot AR1476 appears visible to the naked eye in this haunting skywatching image. 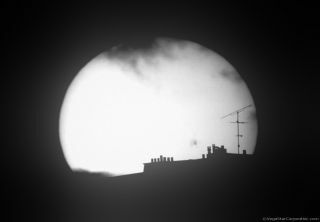 Astrophotographer Vegastar Carpentier captured this image of the sun with sunspot AR 1476 visibly rising over a building in Paris on May 13. This sunspot is 60,000 miles (100,000 kilometers) across in the image and was first detected by NASA's Solar Dynamics Observatory spacecraft on May 5. Its large size led scientists to call it a “monster sunspot.” The sunspot began to unleash a series of powerful solar flares as it moved across the sun. The sunspot released M-class solar flares with powerful blasts of radiation from the sun. These flares are medium-strength sun storms that can create beautiful northern lights when geomagnetic storm eruptions reach earth. Solar flares are events that release a large amount of energy. This usually happens from sunspots, areas where the sun’s strong magnetic field come to the surface. While M-class flares are not typically dangerous, AR1476 can build stronger X-class flares that may interfere with satellite, communication and infrastructure on our planet.